18 vampire brides! You gotta admit, Drac has a way with women. And Ballet West's Dracula is all you could wish for: tall, dark, formidable, and bloodthirsty. In the first act, he stalks about desperate for a drink, but his fanatically devoted mistresses are empty husks of their former selves. Unable to slake his thirst, Dracula sends his minion Renfield to the pastoral village at the foot of the mountains. I'm a huge devotee of the ballet, Halloween, and gothic Victorian mystery. So when I heard Ballet West was bringing Dracula to the stage, I geeked out in the way only a balletomane can, by pirouetting across the room. After I picked myself up off the floor, I contacted Ballet West's PR department, and commenced begging. They very considerately let me sit in on a dress rehearsal. I even got to walk up on the stage and galk at the massive sets, and they are impressive. The first act takes place outside Dracula's castle and consists of a series of dances and impressive moves from Dracula and his brides--some of whom fly. This ballet, by Ben Stevenson, debuted in 1997, but it hearkens back to the classic ballets like Coppelia and Giselle. The story just provides backdrop for the dancing. The first act reminds me of another classic Les Sylphide in which the stage is filled with ghostly ballerinas. The first act culminates with Dracula feasting on the latest offering brought to him by Renfield. Once he's satisfied, he leaves the remains for his brides to finish off while he sets off for the village below. The second act opens in the village below. It's a time of celebration for Svetlana who is turning 18. The village celebration is dampened slightly by an old woman who has a premonition of somthing evil. Svetlana's beau Frederick proposes, and Svetlana joyfully accepts, but not before she 1) dances around a lot; and 2) makes Frederick ask her father for her hand in marriage. This provides one of the lighter moments in the ballet. Just when a happy ending seems assured, thunder and lightening break up the scene and Dracula's carriage sweeps on stage. This does not bode well for the newly betrothed couple. You'll have to see the third act for yourself. One of the highlights for me was Renfield's solo number. His frenzied movements made me believe he could give the Orkin man a run for his money. Costuming, music, choreography: beautiful. While I've seen it close-up in rehearsal, I can't wait to see it again in performance. Dracula runs through November 1st with matinees on Saturdays at 2:00 p.m. Audiences are encouraged to come in costume! Ghosts a No-Go, but wait, there's more! I arrived at Capitol Theater tonight, 6:45, only to be greeted by a "cancelled event" sign. Not cool, Ghost Investigators. Not cool. So, I tried, unsuccessfully, to find the new location of the former Elizabeth Tea Room's steak and mushroom pie. I eventually settled for "pommes frites" at a Belgian waffle stand. There was a busker playing a Swedish violin--something I'd never heard before--that made the whole cancellation worth it. It was heavenly. But the best news of all! (Drum roll please.) Ballet West is going to let me sit in on a dress rehearsal for Dracula! I'm so excited I can hardly stand it! I can't wait to bring you the inside scoop. I feel just like Jill Krementz! Photo journalist and author...wrote "A Very Young Dancer?" We're already half-way through October and I'm already behind schedule. 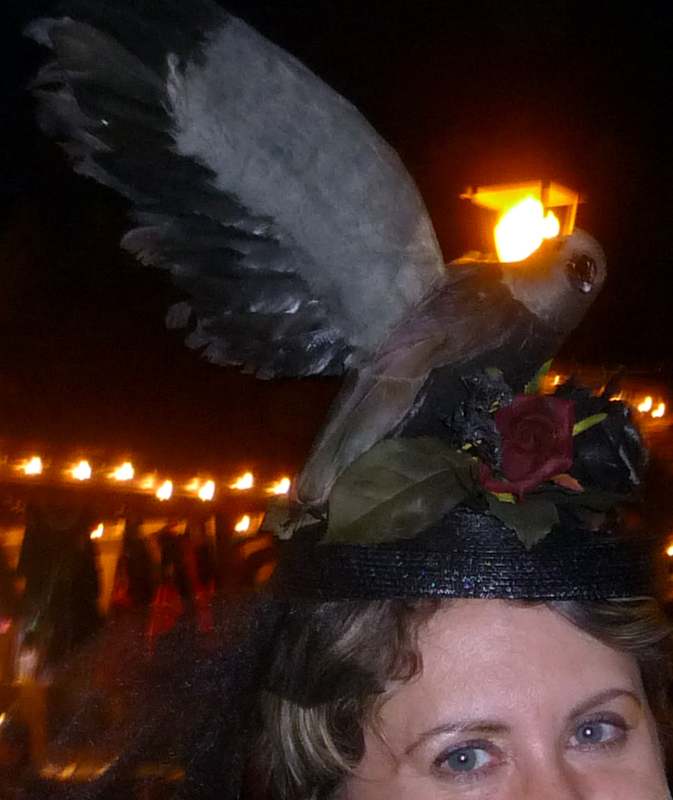 However, I did double duty at Witches' Night out this year (attended both nights), and I made my own chapeau for night 2. And tommorrow night, I'm going to learn about local spooks from none other than the Ghost Hunters of Utah with the Wasatch Paranormal Investigators. Their presentation is actually part of "Dracula Fest," a series of activities put together by Ballet West in conjunction with the debut of the ballet. October 18th at 7:00 p.m., paranormal fans will gather at Capitol Theater to hear local legends and some recordings made by the Ghost Hunters of Utah. One more, non-Halloween event you should know about. The King's Singers will be performing with the Utah Symphony on Oct. 28 and 29. I became a fan when I was 20 and a roommate introduced me to their version of "A New Day." Do you have any suggestions of Halloween activities in the valley that I've missed? Or maybe just a really great Halloween house I ought to drive by? Leave a suggestion in the Comments. *my friend bought me a Scully doll at a garage sale! She comes with a stretcher and a body in a bag! How cool is that?